What Does a Pediatric Endocrinology Nurse Do? Where Do Pediatric Endocrinology Nurses Work? What Is a Pediatric Endocrinology Nurse? A pediatric endocrinology nurse works with children from birth to age eighteen, treating and managing endocrine disorders. The endocrine system produces hormones that help regulate processes that occur in the body such as breathing, growth, fluid balance, appetite, digestion, weight control and reproduction. 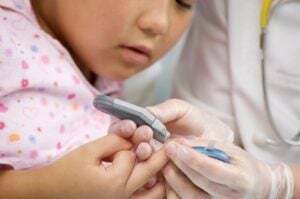 The most common endocrine disorder a pediatric endocrinology nurse will treat is diabetes mellitus, as this condition is seen as young as infancy. Other endocrine disorders the nurse may encounter include: hypothyroidism or hyperthyroidism, pituitary problems, adrenal diseases such as Addison's, childhood obesity, and more. Many of these disorders can affect a child's growth and development, thus the nurse works closely with the patient's parents to educate them on the treatment of the disorder. Prospective pediatric endocrinology nurses should have experience treating children in a medical setting, and a background in or strong working knowledge of diabetes is also helpful. This type of nurse may see patients over a long period of time to track growth and disease progression, so the ability to form relationships is a must. Excellent communication skills are also of paramount importance, since pediatric endocrinology nurses must keep parents up-to-date and help to calm children who may be frightened of the necessary tests and procedures they must go through. What Are the Education Requirements for a Pediatric Endocrinology Nurse? To become a pediatric endocrinology nurse, the first step is to attend an accredited university or college and graduate with a Bachelor's Degree in Nursing (BSN). To start working as a nurse, passing the National Council Licensure Examination (NCLEX-RN) is required. Upon successful completion of the examination, many pediatric endocrinology nursing positions require some experience. To obtain the best experience, the nurse should seek experience in diabetes education, internal medicine, endocrinology and pediatrics to prepare for a career in pediatric endocrinology. A pediatric endocrinology nurse must have strong assessment skills, a strong foundation in pharmacology, IV skills, a Basic Life Support (BLS) certification as well as a Pediatric Advanced Life Support (PALS) certification for a hospital setting. The nurse may further their education to become a Nurse Practitioner (NP) that can specialize or work with endocrine disorders in children. This requires additional schooling at an accredited university and licensure via examination. Currently, there is no specific certification that combines pediatrics and endocrinology into one cohesive certification for RNs or nurse practitioners. There are individual specialty options available such as becoming a Certified Diabetic Educator, which RNs can opt for. While none of the certifications are specifically for pediatric endocrinology nurses, there are options within the field of endocrinology, such as diabetes or pediatric certification options, that enhance job opportunities, credentials, salary and experience. A pediatric endocrinology nurse works with the child, the family, and the pediatrician to develop an effective treatment plan to manage the child's endocrine disorder. The nurse will provide education to the child's parents regarding how to deal with the child's condition, including medication education, lab testing and any diet/lifestyle modifications. Depending on the age of the child, this information will be taught to them as well. What Are the Roles and Duties of a Pediatric Endocrinology Nurse? A pediatric endocrinology nurse may work in a hospital setting on a specialized floor that may be solely for pediatric endocrine disorders or for pediatric patients with an array of conditions. The hospital nurse treats acute conditions or symptoms that need to be addressed on an inpatient basis. A pediatric endocrinology nurse may also work in a pediatrician's or other physician's office. The work in this setting is for less emergent situations and focuses on prevention, education and ongoing monitoring/management of endocrine disorders. Due to pediatric endocrinology nursing being a specialty, the average salary is higher than that of a regular RN, landing at around $81,000 per year. This salary can increase with more certifications and experience. Overall, job prospects for this field are good, as there is an increasing number of children afflicted with diabetes and endocrine disorders in the United States.